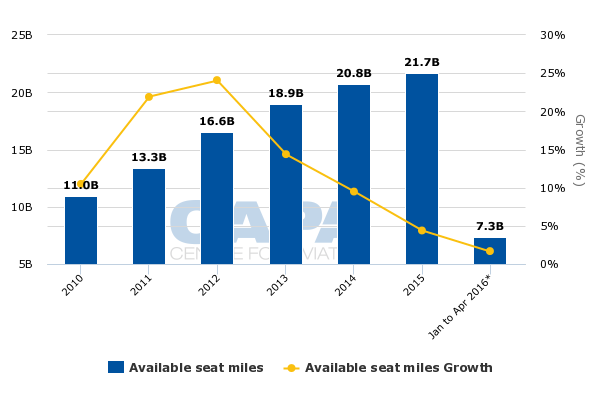 Copa Airlines has revised its 2016 capacity targets downwards to 2% growth, which is half of the expansion the airline recorded in 2015. The cuts are against a backdrop of the IMF forecasting a 0.5% contraction in Latin America’s economy in 2016, which is deeper than the 0.3% decrease in 2015. Given the effects of Latin America’s deteriorating economy on market demand, Copa has cut its margin forecast for 2016. The company is warning that operating margins for 2Q2016 could fall to the low single digits, which is a significant drop from Copa’s historical highs. The company admits that it has little visibility beyond 2Q2016, but believes that unit revenues in 2H2016 will be slightly lower than the year prior. Although conditions remain historically weak, there is some easing of currency depreciation and capacity cuts by other airlines, but it remains to be seen when the benefits of those changing dynamics will materialise. Copa has one of the most favourable geographical positions in Central and Latin America, using its Panama City Tocumen hub as a connecting point for traffic flows between North, South and Central America. But Latin America’s economic weakness has taken its toll on Copa, which has been one the region’s strongest financial performers in the airline sector: its profits sank 15% in 2014 and nearly 49% in 2015. The airline’s operating margins in 2015 dropped to 11.8%, after reaching 19.3% in 2014 and 19.8% in 2013. For 1Q2016 Copa delivered a 17% operating margin, which was a solid result, but still a 3.3ppt drop from the 20% the airline recorded in the same period a year ago. Copa has further revised its operating margin forecast for 2016, from 11% to 13% to 9 to 11%. If the company reaches the low end of its guidance, it would be the first time that Copa has posted single-digit margins during the last five years. Copa’s passenger unit revenues and yields fell 14.5% and 15.% during 1Q2016. Approximately 80% of that weakness is driven by economic conditions in Brazil, Colombia and Latin America, and company executives recently stated that yields in those markets during 2Q2016 were dropping in the double-digit range. The second quarter is typically one of the weaker times of year for Copa, and its yields and passenger unit revenues for that time period are forecast to be quite weak. The company CEO, Pedro Heilbron, recently told analysts and investors that even as unit revenues will be lower in 2H2016 than the year prior, the airline’s performance in that metric during the second half of 2016 should be a 10% improvement over 2Q2016. Generally, that suggests Copa that is bracing for a tough 2Q2016. Mr Heilbron acknowledged that it is difficult for Copa to offer much visibility into 2H2016, given general economic uncertainty and little predictability in how the airline’s competitors will behave. Copa has observed capacity reductions by Brazilian airlines. LATAM Airlines Group is cutting capacity by 10% to 12% in the Brazilian domestic market during 2016, and also slashing supply between Brazil and North America by 25% in 2H2016. The Brazilian airline Gol plans a system-wide ASK decrease of 5% to 8% in 2016. Approximately 88% of Gol’s ASKs are deployed into the domestic market. Mr Heilbron stated that the capacity reductions by Brazilian airlines were a good sign; however, “we have not seen as many reductions in the other markets of South America”, he observed. Recently there has also been some appreciation of Latin American currencies against the USD, said Mr Heilbron, which should also provide some positive momentum for the region’s revenue environment. But it is not clear when the industry capacity reductions or currency appreciation will translate into improving unit revenues. At the moment, Latin American airlines are working from an extremely weak base. In the light of further economic contraction in Latin America, Copa has revised its capacity growth targets for 2016 from 3% to 2%. Previously, Copa has fielded questions about its capacity growth given Latin America’s economic weakness. In 2015 South America, which includes the weakest economies of Brazil and Venezuela, represented 45.6% of Copa’s total revenue. At the beginning of 2016 the Copa management explained that most of the growth is driven by full-year effects from new route launches in 2015, and the upgauging of some routes from Embraer 190s to Boeing 737-800s. During 2015 Copa added new service from Panama City to: David Enrique airport in Panama; Puebla and Villahermosa, Mexico; New Orleans and San Francisco in the US; and Belize. The company has declared that it will add fewer new destinations in 2016, and so far has only announced new flights to Holguín, Cuba; Chiclayo, Peru; and Rosario, Argentina. One method Copa is adopting to handle slowing capacity growth in 2016 is to park more aircraft during the low season, said Mr Heilbron. “We are not redeploying that capacity from Brazil to other markets because that would just kind of be exporting the problem from one place to the other,” he has said. Copa’s planned 2% capacity growth in 2016 is the lowest since 2010, and is drastically lower than its peak of 24% in 2012. Copa has also been working to reduce its fleet commitments as general economic conditions in Latin America have worsened. At the beginning of 2016 the airline had planned to defer one aircraft delivery each for 2016 and 2017. For 2016, Copa now plans to end the year with an operating fleet of 99 aircraft, which is one shell less than YE2015. 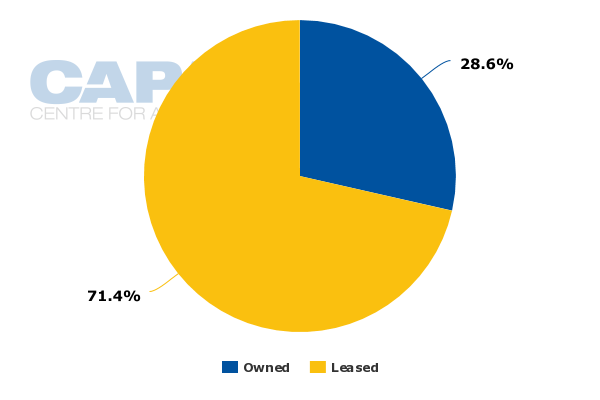 CAPA’s fleet database shows Copa’s operating fleet as of 12-May-2016 was 86 aircraft. Orders include those placed directly by the operator and by lessors assigned to the operator, from 12-May-2016 onwards. Copa Colombia’s operating fleet consists of 14 aircraft – 11 Embraer 190s and three Boeing 737-700s. Copa has also deferred two additional aircraft originally scheduled for 2017, which results in no growth aircraft for the year. The company plans six new deliveries during 2017 and has lease expirations on six jets in its operating fleet. The airline also has an order for 62 737 Max narrowbodies, and the first deliveries of the next-generation narrowbody are scheduled for 2018. Inherent in the agreement with Boeing are rights for Copa to defer a reasonable number of aircraft “without having to ask Boeing for it”, said Mr Heilbron. He also explained that the Max order is structured to coincide with a number of lease expirations and owned aircraft that are reaching 15 to 20 years of age. 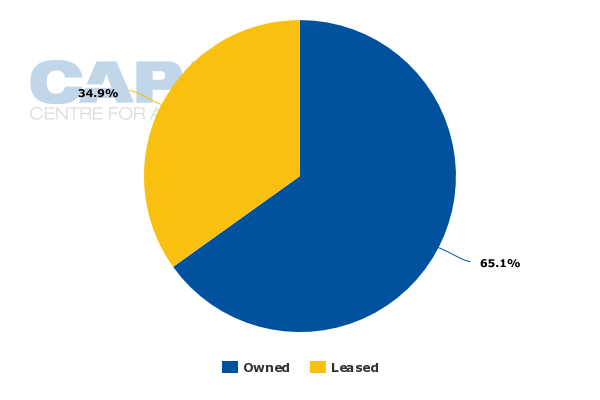 CAPA’s fleet database shows that Copa owns 65% of its mainline fleet and 28.6% of Copa Colombia’s fleet. If Copa curbs its growth significantly for the foreseeable future, said Mr Heibron, there is a way to accomplish a lower growth scenario without having to renegotiate with Boeing. However, he also stated that Copa has been able to defer aircraft from Boeing in the recent past, and if the airline needs to “do a little bit of that, we are confident that we will be able to continue doing it”, he said. Similarly to some of its larger Latin American counterparts, Copa is taking the necessary steps to handle a tough operating environment, which is underpinned by weak economies in the region that drives the bulk of its revenue – South America. Unfortunately, the economic crisis is not relinquishing its grip on Latin America, which means that the fortunes of Copa and its airline counterparts in the region will continue to be pressured for the foreseeable future.